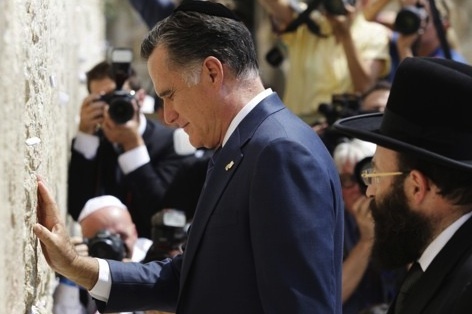 Mitt Romney traveled to Jerusalem earlier this week. He was not there on a fact-finding mission. He was raising money for his presidential campaign. He was also cultivating American voters who live in Israel, while stroking his pro-Israel voters back home with pictures like this one (right) of the candidate praying at the Western Wall. The only attention the Palestinians received came in a back-handed slap delivered by Romney when he spoke to a luncheon sponsored by his wealthy U.S. backer, casino owner Sheldon Adelson. Romney told 40 wealthy donors at Jerusalem’s King David Hotel that Israel has a far superior GDP per capita than “the areas managed by the Palestinian Authority”. Displaying a total ignorance of the prison-like occupation under which the Palestinian people must struggle, Romney explained that the “dramatically stark difference in economic vitality” was due to Israel’s superior culture. Romney did not cross over into what he called “the areas managed by the Palestinian Authority”. He did not see for himself the so-called “security wall”. Instead like the average American tourist traveling under Israeli guides all he appeared to know about the region came from books he or his staff had read. And as I come here and I look out over this city and consider the accomplishments of the people of this nation, I recognize the power of at least culture and a few other things [including] an innovative business climate, the Jewish history of thriving in difficult circumstances and the “hand of providence.” He said similar disparity exists between neighboring countries, like Mexico and the United States. Future polls will have to reveal how much damage among U.S. voters Romney’s amazing display of ignorance about the history and politics of this region, has done to his political standing. One thing is certain, however. The immediate response to Romney’s fund raising speech at the King David Hotel has been overwhelming negative, except among the candidate’s extremist U.S. and Israeli backers. It is a racist statement and this man doesn’t realize that the Palestinian economy cannot reach its potential because there is an Israeli occupation. It seems to me this man lacks information, knowledge, vision and understanding of this region and its people. He also lacks knowledge about the Israelis themselves. I have not heard any Israeli official speak about cultural superiority. Mitt Romney made history on Monday. In a single speech from Jerusalem, he proved beyond a reasonable doubt that to qualify to be a U.S. presidential candidate one needs precious little understanding of history, economics, or reality. Romney has just enough to be dangerous. With no sense of the impediments Palestinians labor under, Romney compared Israel’s economic success to that of its Palestinian neighbors and claimed the discrepancy was due to “cultural” differences and the “hand of providence.” Such blatantly racist and bigoted references to the conflicting parties are only occasionally rivaled by Israel’s most right-wing politicians. Mitt Romney recently said in Israel that Palestinians don’t have as high a GDP per capita as Israelis do because their culture is not as good as Jewish culture. That is both deeply racist and deeply stupid. Mitt Romney, a privileged white man worth a quarter of a billion dollars who has sheltered his money from taxes in Bermuda, the Cayman Islands and Switzerland, and who never misses a square meal, stooped to a new obscene low in blaming the victim on Monday by slamming the Palestinians for not being richer. Palestinian politician Saeb Erekat characterized Romney’s remarks as “racist,” but even that was charitable. Evil, is more like it. How else to explain the Republican presidential candidate’s horribly offensive comments about Palestinians during his recent trip to Jerusalem, so soon after the clunking insults levelled at his British hosts in London last week? Over a £16,000-a-plate campaign fundraiser breakfast with Jewish donors in Jerusalem, Romney aired his deep thoughts on “the dramatic, stark difference in economic vitality” between the Palestinian and Israeli economies. These thoughts were obtained by reading books, he prefixed, before surmising that Israeli accomplishments were down to “at least culture and a few other things” – oh, and also, “the hand of providence”. Mr. Romney did American interests no favors when he praised Israeli economic growth while ignoring the challenges Palestinians face living under Israeli rule in the West Bank and Gaza. He showed troubling ignorance by understating the income disparity between Israel and those areas. Israel, in 2009, had a per capita gross domestic product of roughly $29,800, while, in 2008, the West Bank and Gaza had a per capita gross domestic product of $2,900, according to the Central Intelligence Agency. The question is this: Since the whole trip was not about learning anything but about how to satisfy the political whims of the right-wing, super pro-Bibi Netanyahu, American Jewish casino magnate Sheldon Adelson, why didn’t they just do the whole thing in Las Vegas? I mean, it was all about money anyway — how much Romney would abase himself by saying whatever the Israeli right wanted to hear and how big a jackpot of donations Adelson would shower on the Romney campaign in return. But what exactly accounts for prosperity if not culture? In the case of the United States, it is a particular kind of culture that has made us the greatest economic power in the history of the earth. Many significant features come to mind: our work ethic, our appreciation for education, our willingness to take risks, our commitment to honor an oath, our family orientation, our devotion to a purpose greater than ourselves, our patriotism. It is a scary thought that our next president could be Mitt Romney, who traveled to Israel and ignored the obscene wall Israel has built to guarantee that the Palestinian people will have none of the freedoms he claims to espouse. If Romney failed to grasp the obscenity of Israel’s “security wall”, what else has he missed? Thank you for an excellent piece, Jim. I hope Romney gets to read it sometime soon. Romney’s claims of Israel’s “Cultural Superiority”, as compared to the Palestinians’, is r-a-d-i-c-a-l racism pure and simple. Same applies to the other comparisons his arid mind concocted. In his comparison, Romney has actually infused and nurtured one of the most blatant and hated anti-Jewish Semitic utterances I have heard since a long , long time. As most of us know, anti (Jewish) Semitic bigots falsely and hatefully claim that “Jews control the banking sytem, the media, publishing, the entertainment world, medical profession, sciences, literature, music, etc.”, and these hateful misfits falsely accuse “Jews” in America, who only represent 1 1/2% of the US population, of owning a disproportionately great deal of influence over the economic, scientific, cultural, wealth of our country. So, to what will Romney atribute such a comparison if it came up? Will he come to the false conclusion that the “Jewish” community in America is culturally, economically, and socially superior to the “non-Jewish” Americans, and that it is somehow due to Providence? Just wondering how far will Romney be “romning” in world affairs? Can we start using the “Verb”, “Romning”, to mean that “a person is blabbering and hurling racist insults, with no clue to facts on the ground, or to the subject he/she is talking about”? Romney’s statements throughout his trip, as well as a number of unscripted remarks he has made earlier has convinced me that not only is the man ignorant but that his business and political successes, such as they are, are due to the guidance of an outside hand (nothing supernatural but a personal adviser or group of advisers who, of course, when he’s running for office, can’t be with him at every moment. It is quite likely that he was brought into Bain Capital because of the name of his father and his wealth and was told, ‘Don’t worry about a thing, you just sit in your office and look important and we’ll make you rich.” He may have approved the health care bill while Governor of Massachusetts without knowing its details and that applies to other positions in which he has been accused of flip flops. The fact is that Americans have never had a worse choice of presidential candidates and that the next election arrives at the ascendancy of Zionist political power over Washington and our political process. On one hand, we have Romney, a talking puppet and on the other, Obama, who is smart enough to tell right from wrong and who persists in doing wrong and who has been allowed to get away with it by millions of Americans who should know better. I didn’t vote for him in 2008 because I more or less expected him to do exactly as he has done and thus I can not conceive of voting for him in November. Yes culture does make a difference. A culture of suffering occupation and deprivation, of having your basic resources, land, water, confiscated by a foreign power, of being denied the right to travel more than five miles in your homeland,of having your power cut off, of having your schools shut down, of having your homes invaded by occupying soldiers or maybe just knocked down by bulldozers, or having family detained indefinitely on “administrative detention”, having your government’s tax revenues seized by the occupying government, etc., these aspects of your culture do have some impact on your people’s ability to function economically. Glad Mitt understands these nuances. “Free people and their free enterprises are what drive our economic vitality.” Well, Mitt, you are so right! And please tell us how free the Palestinian people are? Tell us how free the Gazans are when they can’t even sell their strawberries in Israel, West Bank or Jerusalem? I have seen Gazan truck drivers in long lines, sleeping by their trucks, waiting to see if Israeli security people will allow them to pass through the Eretz checkpoint to travel on with their goods. If they can’t – and most can’t – they drive back and sell those strawberries at very low prices, to their own restaurants – or just throw them out! We were once told that, if Gazans could sell their fresh fish, critus fruit, and strawberries in Israel, they could be econonomically successful. This is only ONE small story of the lack of freedom Palestinians endure to operate a successful economy. Does Mr. Romney have a clue about any of this? I pity the poor man, but, more than that, I pity the nation if he becomes president. Thank you, Jim for your honesty, as usual. What Romney said is incredible. But better he say it now than in the office as president of this great land, should he by some fluke of ignorance in the voting public, be elected.Let’s get all his ignorance out in the sunlight while there is still time to see and hear it. He should know that it is the “truth that makes for freedom,” not lies. This article and comments should be read by every Senator, Congressman, and the White House of the United States. I cannot believe that anyone who makes any effort to read news, not necessarily just the MSM, could make such uninformed statements as Mitt Romney did regarding the culture and economy of the Palestinians. Pure ignorance!